Llorente, Morata, Gomez: Who should be Barcelona＇s new Henrik Larsson? Llorente, Morata, Gomez: Who should be Barcelona's new Henrik Larsson? Barcelona have confirmed they want to sign a striker this month, but who? Ernesto Valverde made it clear in Saturday's press conference: Barcelona want a new striker in January. Munir's exit means there is no backup for Luis Suarez. Finances will impact any operation, though. 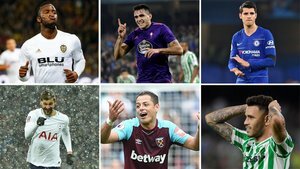 The La Liga leaders want a loan until the end of the season. They want a player who doesn't need to adapt, knows European football and, if possible, the Spanish league. ¿Quién debe ser el 'nuevo Larsson' del Barça? Various names have come up. Tottenham's Fernando Llorente, who hardly plays for Pocehttino's side, is one. A number of Spanish clubs are keen on him. If Barça signed him, his height would offer a different option in attack, given he's 1.93m tall. Celta Vigo's Maxi Gomez is also on the list. The Uruguayan has scored nine times in La Liga this season but Celta's position in the table mean it's hard to see him leaving. They would lose Iago Aspas' best partner. Alvaro Morata is maybe the least short-term option. If he comes, he could be the 'top' forward that Barça hope to sign in the summer. The Chelsea man would be delighted to come but Barça have doubts due to his Real Madrid past. To sign him on loan, too, would cost much more than the other options. Another candidate is ex-La Masia forward Tonny Sanabria. He hasn't played loads for Real Betis this season but has taken advantage of recent chances, scoring two goals. Still, the options Betis have in attack and the good relationship between the two clubs could make a loan possible. Former Granada striker Odion Ighalo is also on the shortlist. He has been in China for two years and last season was the top scorer in the league. His team, Changchun Yatai, have been relegated and he wants to return to Europe. There are offers in England but Barça would be an attractive option. Finally, Michy Batshuayi is out of favour at Valencia and set to return to Chelsea. He would also fit the profile Barça are after, while West Ham's Javier Chicharito Hernandez is another option.